These magnets are magnetised between the two 10mm x 10mm faces. Don’t let them fool you, they might not look like much but they have an incredible magnetic pulling force for their size. The magnets are coated in several layers of Nickel, Copper and Boron to enhance the lifespan of the magnet and the coating also provides a clean finish. They are commonly used in industries like engineering, manufacturing and packaging. In Addition to this, they are also often used in theatre design, model making, exhibition design and furniture making. The magnets are also widely used as shock absorbers by repelling the magnets against each other. Click “sample order” if you wish to receive a free sample. Simply pay the postage costs and we handle the rest! 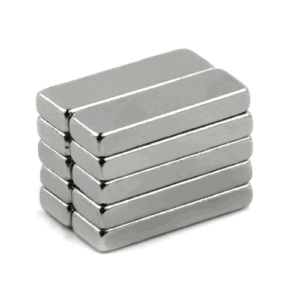 You will receive one 10mm x 10mm x 2mm Block Neodymium Magnet.